A family run business, Rock DG started from humble beginnings by the late Theophilos Efkarpidis (Tom) in the 1960’s. 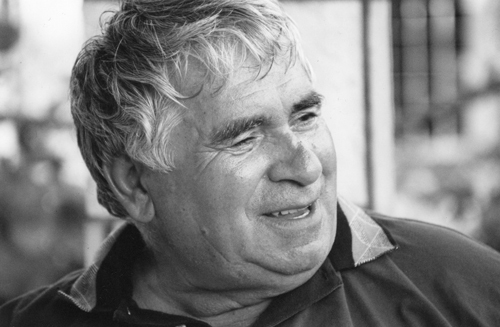 Few individuals have left a greater mark on Canberra’s history than Tom Efkarpidis, a prominent figure in our local history. From humble beginnings to financial success, Tom was undoubtedly motivated, hard-working and passionate about Canberra, his businesses and more importantly his family. Moving to Australia in 1962, and later settling in Canberra in 1964 with his brother Anastasios (Tim), the brothers worked hard to establish themselves in this new city. Working a sundry of jobs including as a painter and a cook, Tom saved his hard earned dollars until he was able to build and open a fish and chip shop in the newly established suburb of Curtin with his brother Tim called “Curtin Fresh Fish and Cooked Supply”. This was a turning point in Tom’s life, and he never looked back. His fast growing business saw people line the streets just to get a taste of Canberra’s freshest and best seafood. Around town, Tom was known as the master of fish, a maestro, he knew fish better than anybody else in the market! He was inventive in his ideas and introduced popular dishes and food delicacies to the industry. Creating innovative storage methods, and purchasing fresh from the Sydney Fish Markets, business was booming for the quaint little fish shop. Working around the clock, Tom always pushed to achieve better results and continually move forward. Two years later, the brothers had amassed enough wealth to purchase their first property - the Macquarie Mini Market and s o their journey among the world of supermarkets began, including shops in Higgins, Chapman, Southlands Mawson and Yarralumla. It was Tom’s inspiring and innovative ideas that saw their business prosper, Tom had an amazing ability to come into a business, review its place within the market, and then revive and build upon the businesses strengths. By far, one of the most important accomplishments of the two brothers was their idea to join and become founding members of the Shoprite Corporation in 1975, an enterprise consisting primarily of Greek Australian merchants in the supermarket industry which united their purchasing and selling power to compete with the likes of Coles and Woolworths. The new corporation took ownership of 30 supermarkets in Canberra, attracting 55% of the business trade in Canberra. With over three million dollars turnover each week, this gave the shareholders of the group the ability to purchase buildings and offices. Shoprite launched exciting advertising campaigns, offered competitive prices and serious progress was made in this industry in the local market. Yet despite the success of this commercial venture, Shoprite eventually came to its demise and by 1985 Tom and his brother Tim decided to exit the group in search of their own venture. Continuing for some years in other supermarkets around Canberra, it was the purchase of Cannons Food Barn in 1986 that cemented their success. Together with a few other businessmen, Tom and Tim formed a chain of supermarkets throughout Canberra. By 1992 they had built and administrated one of the largest resource warehouses in Australia storing retail products owned and operated by the Australian Independent Wholesalers (AIW). The Cannons Supermarket had a competitive edge, not only was their business Australian owned, but their staff had a connection with the community; they really cared about their customers. Providing employment to approximately 1,200 local staff, their activities supported the growth and social role of Canberra, allowing the business to financially contribute to cultural and sporting activities in the capital, as well as supporting growing charities. In June 1996, the Cannons chain was sold to Woolworths. Tom never ignored his interest in the development and real estate markets, and building upon the substantial wealth accumulated over the years, Tom and his brother purchased and renovated the Melbourne Building in Civic and acquired the previously government owned Belconnen Fresh Food Markets, a natural progression having worked in supermarkets. The Markets were given much needed rejuvenation and injected with life and culture. Becoming an exciting fresh food hub for all Canberran’s, the markets became the place to chat, drink coffee, shop and see friends. As the company grew, a second generation came through the ranks seeing the children of both Tom and Tim followed their father’s footsteps into the world of property and real estate. Tom’s children John and Maria eagerly joined the supermarket trade in 1984 and 1986 respectively. As the progression was made into the real estate industry the family was operating as The Efkarpidis Group (TEF). As new ideas and new directions became apparent among the family company, an eventual a split in 2005 which saw the formation of Rock Development Group to pursue exciting new ventures in the property realm. Rock Development Group formed in 2005, underpinned by Tom’s three children John, Maria and Susie. This new venture looked at ways to develop the strong foundations already laid by their father and strive to achieve environmental excellence.